Shopping can be a sport to some, a pain to others. I have to admit, I’m not a shopper except at Christmas time, then I love to shop! When I do shop, for the most part, I will do a lot of it online. Sometimes it is easier to find what I am looking for online. For example, Luke, my horse, is a draft horse, so I can’t just walk into any tack shop & buy stuff for him. Sometimes, it is easier to purchase items from smaller companies than it is from a big box company. Because of this, you want to make sure you are being SAFE and SMART with your purchases. 1. Whenever possible, look for the little padlock icon in the URL (where it says http://www…..). That padlock tells you the company is using a secure website. It is more secure, your information is more protected. 2. If it’s not a secure site, use PayPal or Google Wallet. Both of them offer the consumer protection against fraud. Make sure you read their terms and conditions. Understand there are time limits to request your funds back. Scammers know the terms and conditions better than you do, so if they are dishonest, they will try to stretch it past that time or try to catch you up and get you to do something that goes against the company policy. You are responsible for knowing all the details. I wish I could say everyone is good and honest, but in reality, they aren’t. 3. Never Never Never wire someone money. If they don’t use the above, you don’t want what they are selling. I wish I could say this more than once or have you repeat it over and over. They will come up with great reasons why you should wire the money. DO NOT LISTEN! The same is true for using money orders. Keep the same mindset. 4. The old adage “If something is too good to be true….” Definitely applies here. Sometimes the cheapest isn’t the best. Make sure to look for hidden “maintenance” fees or outrageous shipping. One example of this happening is with online contact lens companies. They will advertise crazy inexpensive pricing for their contacts, when you go to check out, there will be ridiculous shipping charges or a “maintenance fee” tacked on. It might have another name, like “processing fee.” No matter what cute name they put on it, it adds to the price and it might not be cheaper. Too often, by the time you get to that point, you see the amount but you have already put in your information and you don’t want the hassle of starting over. They capitalize on the psychology of some behavior and still get the business. 4. Auctions are another great way to get something for a good, or even great, price. I use them often, but again, use only secure sites or PayPal, etc. Do your homework. Don’t get so caught up in the bidding that you end up spending more than you can find it elsewhere for. Take a minute, look up the item online, see what price you can get it for, then pick a price you’re willing to spend and don’t go over it. A lot of the better auction sites offer proxy bidding so you can put in the price you’re willing to spend and then walk away. Have the mindset you might lose, but you’ll be happy if you win. One of my favorite online auction is Samsclub.com. This is a fun one because you know the product, you know it’s backed by the company, and, for the most part, it is all brand new merchandise. It made it to the auction because the item is low in the club or the on hand numbers on-line are too low to keep it on their website, so they move it to the auction to clear it out. For the dog and horse owners, another great one is Horseloverz.com. One nice feature is you can wait up to four days to actually purchase your winning items, so if you’re bidding on quite a few items, you can pay for them all at once and have them shipped out with less shipping costs. It is a little messy to wade through all of the items, but once you get comfortable with it, you can learn to use the filters to find what you are looking for. It’s not as easy to find the dog stuff, but they have it from time to time, so keep checking back, items vary all the time. Another tried and true site you can find a variety of items is ebay.com. If you have any other favorites, please put them in the comments below to share with the readers. 5. When I do shop in person, I like to support small businesses so I always make sure to grab their business card the first time. Some of the them now use PayPal Here, square trade, or some other form of mobile credit card processing. Sometimes these are connected to a smart phone or tablet. It doesn’t mean they are not safe, but if you don’t recognize the company they are using, it is OK to ask them. Pay attention to your credit card statements. 6. If at a Brick & Mortar (Wal-Mart, Target, etc) always always run your card as credit, not debit (even if it is a debit card). By doing this, you are protecting yourself from someone seeing you key in your pin. The person standing beside you on their phone “texting” could be snapping pictures of your credit card and memorizing your pin. It also protects you more as a consumer. 7. Make sure you have complicated passwords for anything and anyplace you would be putting your personal info into. This includes social media. If you use a smart phone to shop, always lock it (you should anyway) and don’t use 1,2,3,4 as a password. Make it something only YOU know, not family & friends. Don’t use birthday! LOL It is important to use something unique. 8. Trust your gut! If something seems shady, don’t buy! No purchase is worth it. 9. Last, but not least, if you are truly concerned, get a second card / account that you use for online shopping / small business purchases. Be careful of the fees that are involved. I don’t do this because I follow the above steps. I probably purchase 60+% of non food / household items online. It saves me time & allows for me to find the best price. Oh….bonus tip….if you find something online that you really like from a larger company, put it in the shopping cart but don’t purchase. A lot of times, within 24 hours you’ll get a “Did you forget something?” Email and they’ll offer free shipping with a code. I hardly ever pay for shipping or very little. Also check the site “RetailMeNot” for specials or just google the Business name with the word coupon after it and you may find some online. They don’t always work, but it’s worth a shot! I hope these tips help! Happy shopping! Earlier I posted the story of why I decided to try to make my own Chipotle style meal at home, but I wanted to post just the rice recipe by itself. It is good enough to make on it’s own. Melt the butter over a medium heat, add the rice and saute it. You want it to have almost a translucent (or wet) appearance. Add the water, turn the heat up to high, and bring it to a boil. While it is steaming, in a small dish, mix the salt and the lime juice together until the salt is dissolved. You can also get your cilantro ready at this time. If you know how to chop cilantro with a knife, go for it, but I use my mini chopper because it works best for me. After the tortuous, tempting 30 minutes of steaming WITHOUT CHECKING ON IT…..lift the lid, allowing the steam to escape and put the rice into a mixing bowl. 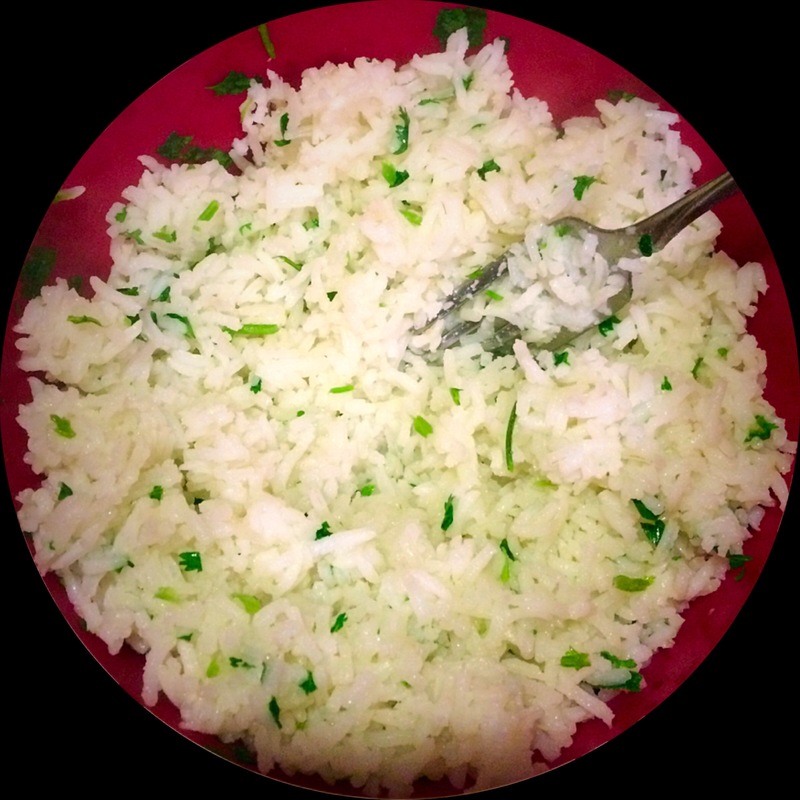 Fluff the rice with a fork while adding the salt / lime mixture. Add the cilantro slowly while continuing to fluff. I love Chipotle. It is one of those restaurants I could eat a couple nights a week. There are times when I’m driving home at night and will weigh the cost of Chipotle over another fast food restaurant and Chipotle will almost always win. One day recently, I started thinking about it and realized I am spending money for four ingredients. I get the steak bowl with white rice, cheese, and lettuce. I already make their Chips & Pico De Gallo so I wondered how difficult would it be to make their white rice and their steak? I decided to tackle the task. I was going to have Chipotle at home, I was going to attempt to make their steak bowl with the white rice to go with my Chips & Pico De Gallo. I’m not a fancy cook. I’m not someone who can just whip stuff together. I use recipes when I’m trying something new. After I’ve made it a few times, I might tweak it here or there to get it where I want it. Let’s start with the rice. I have to admit, I have never made rice before. Not in a real way. I would buy box versions of flavored long grain and wild rice, but never a bag of rice I was preparing from scratch. I didn’t even know there were so many varieties of rice. I started doing research and learned I had to use Basmati rice. I was excited. I knew if it turned out well, I would probably make it often because I really like the rice. After looking at a few different recipes for both the rice and the steak, I decided what I liked or didn’t like from various recipes to create my own. For just the Rice recipe without everything else, click here. I always get the steak option when I go to Chipotle. I love it. As I am not a fan of spicy food, there are times I do feel like I would like it better if it wasn’t quite as spicy at times. By making it at home, I realized I could control the spice level. Many of the ingredients are used in my Pico De Gallo recipe as well, so it’s a great way to not waste ingredients when you make them at the same time. Mix all of the ingredients together in a bowl. Rub the mixture onto the steak making sure to coat both sides really well. Place the steak into the refrigerator for at least an hour but not longer than 24 hours. The longer it marinates, the richer the flavor. I recommend about 2-4 hours. Cut the steak into bite size pieces by cutting lengthwise then across with the cuts about an inch apart. I didn’t have the right cheese in the house so I ended up using a mixture I had, that is why it’s yellow cheese in the picture, but trust me, I will make sure to use my shopping list at the bottom of this post to make sure I don’t forget the cheese again! I love Chipotle’s Chips and mild Pico De Gallo. I’m odd. I do not like tomatoes but I love Pico, Salsa, etc. I won’t put a tomato slice on a burger but I’ll put tomatoes and other ingredients on a tortilla chip. I really wanted to try to make it at home but I was afraid it would be a passing fancy and I didn’t have a food chopper, which I thought I had to have to make it, so I went on the search for one. I found one at Wal-Mart for less than $10, Rival Mini Chopper. Even though the version has changed slightly, they still have one available for less than $10. I could not wait to try it out. I checked the internet for recipes for the Pico and found a few different versions. After trying it a few ways, I have finally come up with a recipe I like and have made it many times. My friends and family love it so I must be doing something right with it. Fun Fact….What is the difference between Pico De Gallo and Salsa? While they are both very similar, Pico De Gallo is always fresh, made with fewer ingredients cut more in into chunks, and served chilled. Salsa is cooked, more of a sauce, and may contain more ingredients. You can make salsa ahead of time and preserve it by canning it which you can not do with Pico because it needs to be served fresh. I have learned from experience my Pico recipe only lasts about a day to a day and a half and then the flavor doesn’t taste the same and needs to be thrown away so you don’t want to make up too much at one time. I will say it goes quickly though, so don’t be surprised if your family or friends start eating and don’t stop. I would say to make one serving per every four to six guests depending on how much food you are serving with it. I usually put the Pico out ahead of the food for my guests to munch on while they are waiting for the food, so I go through more of it. Over quite a few trials and errors, I am going to be specific about how I prepare it to maximize texture and flavor. Because I am not an expert cook by any means, I am going to be pretty detailed with how I prepare everything to help those, like me, new to experimenting with things outside of meat and potatoes or pasta. It is pretty easy. As you prepare each item, just throw it into a mixing bowl. Starting with the Roma Tomatoes, wash them in cold water, cut them in half lengthwise and scoop out the seeds and juice. I use a spoon to make sure I have all the seeds out and then place it down so the remainder of the juice runs out while I cut the other tomatoes. Make sure you are using a sharp knife. It is the best way to cut the tomato without “squishing” it. The sharper the better, just be careful. I don’t cut the top of the tomato off until I’m ready to start dicing it, I have found it is easier to scoop the seeds and liquid out if the top is still intact. I learned the hard way NOT to use the food chopper for the tomatoes. Dice them with a knife. It may take a few minutes longer if you aren’t used to cutting food up that small, but it is worth the extra time. I used to take me about 45 min to do a serving (yes, I’m extremely slow when I’m first making something because I have to keep going back to the recipe, I’m extra careful cutting, etc) but now I can usually have it done in 15 min or less if I’m just making one serving. If you would like a little juicier Pico and you don’t want to remove the seeds, you can also dice it this way. Video how to dice a Roma Tomato What did we do before the internet to help us figure all of this out? Cilantro – I can not cut Cilantro. I have followed the steps, I have looked it up many times and have learned, it’s ok, just use the food chopper! So, if you are talented with a knife and comfortable cutting up cilantro, then go for it. If you’re like me, don’t feel bad. The chopper was invented for people like us. Wash the cilantro really well, pat it dry with a paper tower, pull out any wilted or discolored pieces. Cut the stems off and throw them away. Throw the leafy part in the chopper. I usually let it cut it up until it doesn’t look like it’s doing anything anymore, take a small spatula to push the cilantro down off the sides, and run it again for a few seconds. It’s easiest to then scrape it into a 2 cup glass measuring cup so you can see how much you have cut up. Once you get more comfortable making it, you will find you don’t need to measure any more, but for starting out, for me, it was the easiest way and dumped out of the glass measuring cup smoothly. Don’t bother washing out the chopper. If you want to try your hand at cutting it instead of using the chopper, WikiHow has a pretty detailed example. Jalapeno – Wash the jalapeno, cut the top off, and then cut it lengthwise. Make sure to get all of the seeds out if you want it to be mild. I throw the seeds away so they don’t accidentally get mixed in with the pepper while I am cutting it up. They are sneaky buggers and attach easily! You dice it up pretty much the same way you do the Roma Tomato. Red Onion – Cut the red onion in half and I cut off both ends. I peel off the outside skin. Then I cut the half into quarters, throw it into the chopper, and let it work it’s magic. Yes, I know you can dice it yourself, but honestly, the chopper is less complicated for me. I throw the onion in the mixing bowl with the other ingredients and mix it all up. Lime – Roll the lime against the counter with your hand. This is a tip I learned a long time ago to get more juice out of a lemon, tried it and found it helps with the lime as well. You want as much lime juice as you can get from it. I also read where you could put it in the microwave, but I never do that, I just roll it along the counter. Cut it in half and then you can either squeeze it directly into the bowl of ingredients or use a juicer. You don’t need anything fancy to get the juice from the lime into the bowl. Do not throw the lime away just yet, just set aside. Mix everything together one last time and then I will transfer to a container with a lid and place in the refrigerator to chill for at least 30 minutes. For the Chips – I LOVE the chips you get from Chipotle so I will usually grab a bag of white tortilla chips from the store, dump half the bag into a large plastic bowl with a lid, take one half of my squeezed lime and hand squeeze any last lime juice I can over the chips, sprinkle with a little bit of salt, put the lid on them, and shake it gently to distribute the juice and salt. Add the other half, using the other lime half, repeat with the lime juice and the salt, shake gently again, and you have some yummy chips to go with your Pico De Gallo. I occasionally enjoy toast with peanut butter and strawberry jam in the morning for breakfast. I am not one to eat PB&J sandwiches, so this is the only time I get to taste these flavors together. I normally use American Spoon Early Glow Strawberry Preserves which I purchase from a small store up in Michigan when I’m there. I love the taste, the texture, and there are only three ingredients; strawberries, sugar, and lemon juice. I normally get there before I run out but this time I did not, so there I was, in Wal-Mart, looking for an alternative. Before discovering the American Spoon product, I had always been loyal to Smuckers so when I saw the Smuckers Natural Strawberry Fruit Spread, I decided to purchase it. I liked the fact it only had four ingredients. It was non GMO (which, to be honest, I don’t know if other brands are as well or not, I know sometimes they put labels on items for consumer value when the truth is, most products fall under the same category and just don’t say it). Either way, I bought into the hype, the ingredients, and it had the Smuckers’ label, so it went into my cart. I still had a day or two of the American Spoon product left, so I didn’t try it right away. It sat unopened for about four days. I decided to open it and try it this morning. Now, before I go on with my review, I know one is a preserve and one is a fruit spread, so I want to explain the difference and also say, I’m trying not to compare the two. It would not be fair. I am reviewing it on its own merit as a fruit spread and nothing more. Preserves mean the fruit contained is in the form of actual fruit chunks. “Fruit Spread” usually means it is a jam or preserve made without sugar. Since the second ingredient on the Smucker’s product is sugar, I realized they were not following that particular logic. Since the first ingredient is strawberries, I was hoping this product more closely resembled a preserve and not a jam. In Jam, the fruit contained is in the form of a pulp. It can get rather confusing so I usually lean towards preserves because then I know there should be some actual fruit in the product! Upon opening, I saw the typical smooth top you generally see on a new product. If you look closely, you can see some shadows, which told me there were some chunks in it. I don’t like my toast extremely “toasty” I only leave it in the toaster long enough to harden the outside but it is still someone soft when you bite into it. I put my Jif Extra Crunch Peanut Butter on the toast and then dipped my knife into the new fruit spread. I have to admit, as the name says, it did spread quite nicely. Even with the extra crunchy peanut butter, it was easy to spread around without having the appearance of being drippy. I also noticed one or two actual chunks of strawberry. Always a plus when you aren’t sure what you are purchasing. I bit into the toast. I intentionally did not bite the side with the largest strawberry chunk as I wanted to get the real flavor. I was a little disappointed at first and had to remind myself not to compare to the American Spoon product and really think about what I was tasting. Could I taste the actual strawberry OVER the peanut butter. Yes. Was the flavor pleasant? Yes. Surprisingly, the part with the strawberry chunk tasted the same as the rest, so the flavor was consistent. I also appreciated the consistency was thick enough it did not drip down onto the plate or my hand every time I took a bite. I think the product is good, not great. I would like a little more strawberry flavor. Even with sugar as the second ingredient, I will say it is not very sweet, the strawberry is more prominent than the sugar but still a little faint from what I would prefer. Compared to other Smuckers products I have had, I would say it is the best of their products. I compared prices at Wal-Mart between their regular Strawberry Jam I grew up with and their Natural product. There wasn’t much difference so I would recommend the Natural over the regular Jam. Just the ingredients alone make it a better choice. If you are a Smuckers fan, you will appreciate this product. I would say overall, it is better than average but not the best I have ever had. It is a fair alternative when cost and availability is a factor. I have been sick for a while now. I have put off going to the doctor and hit obstacles when I finally decided to go. Obstacles I would honestly laugh at if it was someone else, including losing my debit card, getting dates wrong, etc. Last Friday I started calling regular MD offices and they were all saying 5-14 days wait to be seen. I finally decided on one who get get me in on Wednesday April 15 but after a really rough weekend where I almost took myself to the ER, I decided to go to an urgent care office Monday and not wait until Wednesday. I looked at reviews online and did not seem too impressed with some of the reviews. I finally found one; Concentra, who seemed to have good reviews and appeared to put patient care first. They also had a coupon for $10 off for cash customers which I printed to bring with me. I also printed the patient forms so I would have them filled out when I arrived. I looked at the various locations in the KC area and decided to go to the Grandview Location. Upon arrival, I saw people standing so I was a little concerned. I went to the desk and was told, almost apologetically, it would probably be a 45 minute wait. For a walk in clinic, I had expected at least a 20-30 min wait, so 45 min was no problem. I knew I had to be seen. I handed off my paperwork and went to sit down. There were plenty of seats, the waiting area was plain, but clean. There is a pole right in the middle so if you wanted to watch the television that was in the waiting area, you had to choose a seat around the pole. The staff at the front desk seemed cordial. They seemed aware of what was happening and didn’t seem to just blow patients off. After about 30 minutes, I was called back to the front desk where I was told today’s visit would be $150. That would cover the visit, all lab work, etc. I paid and was told it would just be a few more minutes. I noticed some cute interaction between one associate and a child playing in the waiting room. She did not know the child but was giving him a pleasant experience in a doctor office. About ten minutes later, I was called back up to the front desk. She had not realized I had the $10 coupon and asked if I would rewrite my check for $140. I appreciated her acknowledging the mistake and not just blowing it off since I had forgotten to mention it to her even though I turned it in with my original paperwork. I was taken back about 50 minutes after arrival, so they stayed true to their 45 min wait. The nurse was pleasant. Seemed to listen to me. Asked me basic questions. I was then told she wasn’t sure which doctor I would see, the male or the female, but she liked them both. She also gave me a little info about both and then left. The room was very plain. Plain gray walls. The doctor came in and seemed friendly but honestly seemed a little unobservant. I did not feel like a priority at all. He would ask me questions, which I answered honestly, then would say something that did not make sense. For example, I explained I had my gallbladder removed and then he makes a comment like I might need to have some tests ran to look at my gallbladder. Ummm ok…I don’t think the surgeon kept it. He told me I probably just had a virus that needed to run it’s course, which I would appreciate if it had only been a few days, but again, I pointed out it had been almost a month! It appeared like this information was just hitting him and then he stopped to think for a few minutes. He sat down and just stared at nothing for what seemed like eternity. It set a really uncomfortable feeling. He didn’t say anything, didn’t look at me, didn’t look at my chart, just sat there staring, but it didn’t seem like he was staring at anything in particular. It wasn’t even like he was staring off into space like one would do when they were thinking. When he did comment, he almost made me feel silly for coming into an urgent care. He kept saying I would probably need to go and see a gastroenterologist, urgent care couldn’t really help me, etc. I had asked him to run a particular blood test. It was the SAME test I had asked the front desk if they would be able to run, which they said they would be able to. Even though I had mentioned it to the front desk, the nurse, and the doctor when we first started talking, he didn’t seem to want to run it. He just wanted to write me a prescription for nausea and told me to take Prilosec because maybe I had an ulcer or something. I was so frustrated at this point! Upon my insistence one more time, he finally agreed to run the blood test I had originally asked for, but still seemed resistant. When the technician arrived to draw my blood, she was wonderful. She talked to me and seemed to be more interested in what was going on with me than the doctor was. She understood my concerns and said she understood why I wanted this particular test done before I did anything else. Then she said I would have to pay more for the test. I didn’t understand this since I had been told at the beginning my $140 would cover all lab work. The website boasted about how they didn’t have hidden fees, etc. I was told it only covered lab work that could be done in house, but not the tests that had to be sent out. Yet another frustration. None of this was explained. I had clearly stated I wanted this test done AT THE BEGINNING and was not told there would be an additional fee. I agreed to pay it because I wanted it done. I went to check out, paid the additional amount, and left extremely disappointed. What a waste of $140. I overpaid for a doctor who didn’t listen, didn’t pay attention, and, in my opinion, didn’t want to do his job. I NEVER filled the prescriptions, the test results came back negative (which is fine, at least I knew) and, within a couple of days, I started feeling better again. Perhaps if you have a sprained ankle or broken bone, which doesn’t really require any thought and it very obvious, this would be a good place to go, but I will never go back. It was a waste of my time and my money. Every now and then, you stumble upon a new product that is unbelievably good. I had the great fortune of that happening just recently. I was at a PRP International sale and they had Just Enough Heat there showcasing some of their products. I had never seen them there before so we went to look at the products they had. I am not a “heat” lover. I don’t really care for spicy food too much. I want to be able to taste the flavor of the food I’m eating, not burn my mouth. The first thing I tried was their Savory Saltine Flavoring. While I did not end up purchasing this, I was impressed. With this flavoring packet, you change the flavor of basic, saltine crackers and give them a nice pop of flavor. It is mild, but packed with flavor. I avoided a lot of their products because of the heat factor, but they recommended I try their Jalapeno Marinated Asiago & Parmesan Cheese spread. They gave me a little sample with a small piece of bread and I was hooked! Even though it has “Jalapeno” in the title, it was classified as mild. I bought a jar of it. I happened to be having a small gathering later that day at my home so I put the jar on the counter away from all of the other food. I didn’t want to share it with everyone, I wanted to be able to enjoy it later. I looked at the jar a little later and saw that it was supposed to be refrigerated. I was surprised because it wasn’t refrigerated or even kept cold when I purchased it, so I was a little concerned. I double checked and no where did it say “Refrigerate after opening” it simply said “Keep Refrigerated.” I put it in the refrigerator and forgot about it for a couple of days. I hadn’t been feeling all that great so I wasn’t really trying to eat a lot. I had a couple of Kings Hawaiian Rolls left over from my party and decided to munch on one. I remembered my cheese purchase and opened it up. The first thing I noticed was how oily it was. I remembered being told you had to stir it up really well before using it. As you can see, the oil is all at the top. After stirring it, the cheeses are very evident. I scooped out a little bit and put it on the roll. It was as good as I remembered it! The combination of the hard cheeses with the olive oil and garlic is amazing. You do not need a lot because the flavor is so rich. The mild Jalapeno gives it a bold flavor without the burn. Over the course of the week, I also tried the spread on pretzel chips and found it to be pretty tasty. I wanted to get some recipe ideas and since it had a Loredana’s label instead of Just Enough Heat label, I looked up the company. They are a small company in Denver. As I was looking through their site, I saw some great recipe ideas, including putting a small amount into a hamburger patty. Yes, I will be trying that as soon as I am feeling better! I also discovered they have additional Asiago & Parmesan Cheese Spreads. One in particular that caught my eye is their Garlic Marinated Asiago & Parmesan Hard Cheese. They also have the same recipe but without as much garlic. It still has garlic in it, but apparently not as much. Since I like garlic, I think I would like the extra garlic. They also have a Winter Truffle version I am a little curious about. At $15 a jar, this is a little expensive for me to have on a regular basis. I appreciate the cheeses used are not cheap and the quality and flavor is well worth the cost, it just isn’t in my budget right now. I definetely will be purchasing a few more jars though so I can try some of the recipes. As I do, I will make sure to share my thoughts on the other flavors. I am so happy to have discovered this great new company. They have other products besides spreads, including a vinaigrette section I will keep my eye on to see if they add a raspberry version. I encourage you to check out Just Enough Heat and Loredana’s….two new companies with some great products, tell them you heard about them from me, maybe they’ll be nice and offer a discount on some of their other cheese spreads! Hey, a girl can hope!